Here are a few “getting started” ideas, tips and tricks for recording and mixing electric guitars. All nonsense. There are no magic numbers. None of these writers have heard your guitar, in your room, with your set up, playing your style, with your song. All I hope to do in this article is to point to possible techniques and tips that may make you think about how to record and mix your guitar tracks. My focus has always been on rock guitars, so even though your recordings may be for a different genre of music, you may find a few ideas that can be adapted to your needs.I’m not going to discuss playing techniques here. There are many online resources. Ultimate Guitars is a good place to start. There are tons of resources, columns and links here. Let’s assume for the purposes of this article that you are working with (or you are) good musicians who have developed their style and chops, and know what they’re doing. No discussion on recording rock guitars would be complete without reference to the classic Slipperman’s Recording Distorted Guitars Thread From Hell article, particularly for distorted, hard rock and metal styles. It’s funny, highly informative and worth a thorough read, unless you’re easily offended. Check out the audio segments at the end of the article, when Slipperman apparently tired of typing. We could argue about the order, but let’s agree for now that these are the most important elements, and move on. You can create a great guitar sound in any situation if you’re prepared to work at it. You will need a couple of microphones and a preamp/compressor, separate or a combo channel unit, a D.I. box and a reamp box if you want to get into reampmg (see below). Spending money is not the solution. Sure, it’s nice to have high-end outboard gear, but experimentation and thoughtful planning are going to give better results. Here are a few ideas for some equipment for various budgets. I’ve just included stuff I’ve actually used – there are many more options available, and I’ve left out many outboard options, such as API and old dbx compressors, as the chances are if you have those you’re beyond the target audience for this post. Try out gear first; it pays to make friends with a local dealer who will let you try out equipment for a day or two before purchase – they do exist; support those guys. When evaluating equipment, it’s important to start with a reference. Record a minute or so (you can always loop it later) of a guitar playing various parts, a few chugs, a conventional rhythm part with a few chords which ring out and are allowed to naturally decay, interspersed with a few licks. Record this cleanly, using a D.I. box if necessary. This is your reference track. Set up an amp/cabinet which you already know. Set it so that you’re getting close to the sound you have in mind, and route the output of your DAW into the amp, via a reamp box (or reversing a D.I. temporarily). Go for a sound that is slightly less distorted or overdriven than you would like. The sound doesn’t have to be perfect, and some mismatching is tolerable. You just need something that you can memorize as a reference. Note the amp settings. Now insert your new gear in the recording chain, but one device at a time. If you’re evaluating recording preamps, don’t change microphones or positioning. The goal is to compare apples to apples. Try out the preamp settings. Are they easy to understand and are effective? Are you noticing any changes as the input stage starts to overdrive? How’s the noise at higher gain settings? Do you like the character of the sound? Try to listen critically to the three main bands of frequencies – low, medium and high. Do your sustained sounds change? Try out any EQ and LP or HP filter settings. Record the output of your new chain on another track in your DAW. Also, without changing anything, record the mic directly via your interface’s vanilla preamp to another track. Compare the two on playback. What did the new preamp do to your sound? Do you notice benefits in using it? If you’re evaluating a channel strip, bypass the compressor and EQ sections and only add them back in when your preamp evaluation is complete. When listening back, be careful not to fool yourself. Louder and/or brighter will generally sound more appealing. Match your playback levels carefully. Once you’ve found a preamp you like, next check out microphones, compressors or anything else you are considering, but stick to the same testing methodology. Let your tests determine what you buy: sometimes a mic will be more effective than any preamp choice, and remember that some microphones work best with some preamps. Depending on your existing setup, you might need a mic more than a preamp, so let your mic choice make your preamp decision. This is particularly important if you’re adding a ribbon mic to your set up, as typically ribbon mics have a lower output and need a matched preamp. A couple more notes on selecting equipment. • Don’t be fooled by manufacturers hype. Just because manufacturer A, B or C are big and can afford to spend more on advertising doesn’t mean that their preamp, compressor or microphone is any better than a smaller manufacturer that largely promotes themselves by word-of-mouth. The internet forums are great to learn what people are saying about different gear, such as Gearslutz, but take it all with a pinch of salt – some of those guys will try to tell you that you need to spend a fortune to get an acceptable sound. You don’t. If you can’t actually hear a significant difference between a $100 mic, or a $1,000 mic in your room, then don’t waste your money. Ideally, I like discrete components. As your studio expands, it’s nice to have the ability to pair preamp A with compressor B and EQ C, which gives you more mix and match variations. Think about your goals. If you realistically expect that your studio will expand over the next couple of years, then consider discrete components. If you just don’t know at the moment, and you’re starting out, you can save some money with a channel strip, where one unit contains a preamp, a compressor and maybe an EQ section all in one box. You save money because it’s more economical to combine these functions on to one chassis with one power supply. If you have a reasonably generous budget, don’t overlook 500 series modules (often referred to as the API Lunchbox format) – they are a perfect compromise between budget gear and the high-end individual components, and save you money as the individual modules are usually substantially less expensive than their stand-alone equivalent, and are a great choice if your plans also include recording live location shows. You can buy a jar of pasta sauce, slop it over some pasta, throw on some packaged Parmesan cheese dust and you’re done. Where’s the joy, the love, the refinement, the subtlety? Spending hours chopping garlic, onions, peppers, tomatoes, adding just the right amount of herbs and spices, adding meat, sausage or shellfish, pouring in some wine and having a vat of the stuff bubbling away for hours is so much more satisfying. The end result will be uniquely yours, and it’s a basis for further experimentation. So it is for guitar sounds. What fits your particular song and the ways you can create it is half the fun. Learning what makes up a great sound, how an amp and cabinet interact with a room and a microphone is immensely satisfying and the sounds are yours. Although the focus of modern recording is to record and process everything within your digital audio workstation (DAW) the old school method of recording a box in a room, with the air and special characteristics of that particular room, is going to get more satisfactory, and unique, tones than using modeling plug-ins or a Pod preset. Having said that, there are some good guitar plug-ins, and they can be helpful (if all else fails) in getting a final tweak to your tracks, but let’s start with the basics. • Rules: Let’s start with the cliché: There are no rules. Actually, I think there is one: getting a good guitar sound is 90% achieved in the room, before it ever reaches tape or a computer. Mixing and adding processing should be to enhance already good sounds, not to fix sounds that are crap. • Before starting, try to have a clear idea what sound you’re looking for, and what the song needs. Dark or bright? Clear or indistinct? Sustain? Overdrive? Resonant? Contained or wide-open? Hunting around hoping to hit on something which sounds good can waste a lot of time and take you in the wrong direction. Generally, if you place cabs in corners, your bass response will increase. If you’re recording in a carpeted room, get an 8′ x 4′ sheet of plywood, or a roll of vinyl flooring, and put the cab on one end so as to increase floor reflections. If you want even more/different type of bass response, put a mic in the corner of the room facing out, and point the cab into the corner. Moving the cab/mic into/out of the corner will allow you to vary the bass response. Recording in a bright room, with hardwood floors and few soft furnishings, is a good thing. You can always tailor a room’s characteristics and some reflections by hanging blankets, quilts and rugs. Installing some permanent acoustic treatment is a very worthwhile investment, and needn’t be expensive if you have some basic D.I.Y skills. • With a multi-speaker cabinet, first pick the best speaker; especially with an older box, they’re going to be different. Listen to them. As with setting the best position for any microphone, you need to listen from where the microphone will be. As we’re placing the close mic an inch or two from the speaker grill, your ears will be there too; it will be loud. Use some ear protection; either plugs or well fitting semi-closed back headphones. Really. Yes, it will change the sound you hear, but you’ll still be able to hear when the cone starts flapping or the limit travel is reached on each speaker, and cabinet resonances becomes apparent, but your hearing need to be preserved. • Learn how speakers behave. When driven hard, there comes a point where the cone reaches the end of its travel – the excursion characteristics. When the speaker flattens out, the sound changes, as does the distortion. Do you want this effect? If so, find the volume spot at which it’s working for you; if not, back off until your get a cleaner tone. With open-back cabinets, another mic at the back can work well, and often yields a less bright tone, but you might have to play around with a phase invert switch for one of the mics. I have found a great sound by putting a cabinet in a fireplace hearth, with a front mic, and a rear mic pointing away from the cab and up the chimney.Another option is to raise the cabinet from the floor. A chair, a table, whatever. Depending on your floor construction, this can affect the low end of the cabinet’s response. • There’s not much over 5 kHz produced by a guitar cabinet speaker, which is one reason that stomp boxes and in-line processors sound so much worse if not played through a guitar amp/speaker, which naturally roll off the higher-end fizz. • Remember that positioning your mic directly in the center of the speaker cone usually yields a brighter tone than positioning the mic off-axis. A common technique is to point the mic at dead center, but then move the mic 2-3 inches from the grill, and slant it slightly so that it’s positioned 90 degrees to the speaker cone. This is a good starting position from which to experiment. • Slight changes in positioning can affect the tone quite dramatically, as will the distance between the mic and the grill. Experiment! • A trick, which works about 20% of the time and is dependent on an individual speaker, is to make an “X” out of duct tape. Place the X at exactly the center of your selected speaker cone position, sticking your X to the grill. Now position the mic dead center behind the center of the X, 2″ back. This can have the effect of reducing the mid/high end, but the highest frequencies are unaffected, unlike moving the mic off-axis. This can create a different color to the tone, without affecting low/mids. Try it and see, if that’s a sound you like. I’ve expanded on this, and occasionally have taped an inverted tea cup saucer over the center of the speaker grill, with some interesting results. • If you have multiple mics, try one on one speaker, and a mic with a different character on another, or even on the same speaker. Combining dynamic and ribbon microphones often work very well. Getting two different tones (one really bright, and one darker) and mixing them later can reduce the amount of EQ you may otherwise apply later, as well as giving you more opportunities to balance the tone, balancing the attack of the brighter tone with the body of the darker track. • Ribbon mics are ideal for close mic’ing of guitar cabinets. They generally have a much smoother, as less pronounced, mid-range and HF characteristic, often having a roll-off at higher frequencies – perfect to control the upper register ‘fizz.’ Ribbons do require more careful handling. • Room Mics. If available, start with two mics; one very close (1-3″) to the speaker cabinet (often, but not always, a ribbon or dynamic), and another, the room mic, much further away. Depending on the size and characteristics of your room, this can be 5 – 15 feet) A large diaphragm condenser (LDC) or a ribbon (depending on room size and characteristics) works well, with the LDC set to an ‘omni’ pattern. Rooms mics positioned low often increase bass response. Change the height of your room mic position and listen to the changes in sound, in your particular room. Positioning ’round the corner’ can work in an L-shaped room, as can a mic in a hallway outside the recording room. • Most ribbon microphones have a figure of 8 polar pattern, also called bi-directional. You can use this as an interesting variation in some rooms by turning the mic 90 degrees to the sound source so that the side rejection of a ribbon’s pattern is rejecting the direct sound, and instead is capturing reflections. This can be an interesting sound in hallways and brighter rooms. Many multi-pattern condensers can be used in the same way. Some ribbons have slightly different characteristics depending on which side you’re aiming at the source. The Royer 121, for example, is a bit brighter on its rear side. • Room Loading. There comes a point, especially in smaller rooms, where the level is high enough to blur directional information and your ears limit. Microphones hear the room a little differently, particularly depending on the pattern selected on the mic. Experiment with the settings available on your room mic; start with omni, then try figure 8. Using a figure 8 pattern and placing the mic appropriately can reduce side reflections in a hallway, for example, and can be a better choice than an omni pattern. • Experiment. I have placed cabs in bathrooms, corridors, porches, parking lots, the end of custom-made air-conditioning ducts, the back of a panel truck, inside closets, inside fireplaces and chimneys and hung from ropes in stairwells and an elevator shaft. Try anything, however odd it might seem, but keep focused on the sound in your head which you’re looking for. • Strumming and Strings, Adding another dimension: Try pointing a small diaphragm condenser mic at a solid body guitar close enough to capture the sound of the pick and the strings; near the strings and the player’s hand, between the hand position and the neck). Mix this in with the amped sound, and it can adds great percussive element to the mix. If you’re recording a semi-hollowbody, try a dynamic mic (back to your i5 or SM57) plugged in to another amp, and mic the amp, or try a large diaphragm condenser mic and record that mic’s output directly as if it were an acoustic. • Before reaching for EQ, move the mic, or select a different mic if available. I prefer to not EQ in recording at all (except for special cases) because the goal is to get the sound right in the recording room. But I do suggest using a HP filter getting rid of the mostly unusable extreme low end – usually below 80 Hz – low E on a guitar is around 82 Hz and perhaps 120 – 150 Hz for lead parts, depending on what’s being played. • Stomp Boxes and effects: Knock yourself out, if it’s part of your desired sound. But I’d suggest that to do not use any types of reverb, echo or delays at the recording stage. They can’t be removed in the mix, and the chances are you have much better versions of those effects in your mix chain. Add these types of effects later. • Distortion: You can’t take pepper out of the sauce. So be slightly conservative when deciding how much distortion you really want. You can add more later, but a wall of indistinct fuzz is going to need re-recording to get it right. Players without a lot of recording experience set up their rig as if it were a live show – and that often means that the overdrive and cabinet distortion are set at levels too high for recording. You probably don’t want to conduct these experiments during the set up for a session, but rather in your own time. Just take some cleanly recorded tracks, even those recorded with D.I. and route these out to your recording room or any other places in your surroundings (see ‘reamping’ later in this article) and try out different ideas and placements. A D.I. (Direct Injection) box is a device that connects the high impedance, unbalanced output of the instrument signal to a low impedance, mic level balanced input, usually via an XLR connector. A Reamp box is used for taking the dry guitar recording to “re-record” the performance though guitar amplifier and/or external effects box(es). The combo amp or cabinet is placed in the live room or any other suitable location to produce the desired guitar tone, including distortion and room characteristics. A reamping box, is almost, but not quite, a D.I. box in reverse, although the Radial JDI and the excellent LittleLabs RedEye can be used for both. Other reamp boxes are the Radial X-Amp, or a Reamp V.2, among others. Rather than running a long cable out of your interface into the recording room and into your reamp box, try using amp head into your control room and run a long speaker cable to your cabinet. Be cautious about grounding issues, and don’t run the amp off a different circuit than your interface. This way you can use a short guitar cable (usually a good idea). You can then make amp adjustments when monitoring through your control room monitors and often this way cuts down on noise. This obviously isn’t possible with a combo amp; if you’re planning on a lot of recording with your combo, know that long instrument level cable runs can add to noise and loss of level and tone. Better to buy a LittleLabs extender.By the way, if you’re a synth. player who stumbled onto this page by accident, trying reamping those synths to get some dirt and room air happening! Like witnessing the process of making sausage, mixing is best performed when the artists aren’t in the room; guitarists in particular are likely to cringe seeing the processing which their sound is going through. If you are the player, and working on your own tracks, be brave and think only of the song and what it needs. • Cutoff Frequency is the frequency for the turnover point; the frequency setting where a change takes effect. • Low Pass Filter (LPF): A filter section that reduces high frequencies. • Band Pass Filter: A filter section that reduces both high and low frequencies. • Parametric EQ: EQ section with controls for frequency, gain and Q. • Graphic EQ: An Equalizer with a number of slider controls set on octave or third octave frequency centers. • Bell EQ: An EQ with a peak in its response. • ‘Q’: How wide or narrow the range of frequencies that are affected by an EQ setting. A high Q curve is narrow and a low Q curve is wider. If a specific band is centered at 1 kHz. a high Q setting will only boost or cut frequencies right around 1 kHz and not affect the signal too far on either side of the selected frequency. High Q settings are used more for surgical adjustments (sometimes called notching) such as removing a ring from a drum or mud from a guitar sound. EQ settings set with a high Q are less obvious, as fewer frequencies are affected, allowing more cut to be used. Lower Q settings are generally used to change the character of a sound, rather than correcting a particular problem. • EQ: Some will argue, but I believe that any boost of over 5 dB is an indication that you’ve done something wrong at the recording stage (unless you’re deliberately creating an effect). A different mic, different guitar or amp settings or a different mic position would be a better solution. Your ears are more capable of hearing a boost than a cut at the same frequency. You can use this to your advantage. To find a frequency where there’s an annoying element to the tone of the instrument, first boost the frequency in the approximate area where you think the problem is. By sweeping through the frequencies with an increasingly higher Q, you’ll be able to isolate the tone – it will be much more pronounced. Now cut the gain at that point so you’re notching out that sound. Balance the Q and the level adjustment so that you’re reducing the sound without affecting the sound in the surrounding frequencies. Remember, do this final adjustment listening to the whole mix; you’ll often find that less notching is needed than you would think if you listened to the track solo’d. • EQ: First, get rid of the low junk that shouldn’t be there. Hopefully, you recorded using an HPF set at 80Hz, but you’ll probably need to scoop out more than that. For lead parts, you’ll probably set the HPF to a higher frequency – maybe 150 Hz. The trick is to make room for the bass, while not thinning the sound too much. A common problem is that guitars and bass clash, and the sound is indistinct and muddy, and the bass becomes swamped by the low end of your guitars. Another reason to make EQ adjustments when hearing the guitars and bass in context – solo’d won’t work here, and you won’t be impressed with the guitars in isolation. 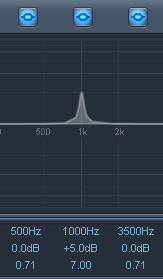 Secondly, there can be muddiness anywhere from 100 to 500 Hz. Find out where it is by setting a fairly narrow EQ dip (higher Q) and play with the inverted bell until you find the spot where you’ve got rid of the less useful mud and achieved some definition. Unfortunately, the effective mid-range of guitars (around 1 – 4 kHz) occupies the same space as vocals. So getting them to coexist happily is one of the challenges you will face when mixing. As the vocals need to be prominent in most cases, you’ll have to learn how to use EQ and compression, delays and reverb together with riding faders or using automation in your mixing techniques to make these two components work together. • Bypass: It’s there for a reason. Use it often, and once again, make adjustments in context, not solo’d. It’s all too easy to tweak your way into a worse sound – be critical, and if your changes aren’t adding to the sound rethink your approach. • Doubling: Do you really have to? Of course, it is often useful, but I prefer to always ask “does the song really need it?” If the part is played, and works off of, or against, the original track, that’s one thing – that’s a performance choice. But doubling a part without adding variations by playing with different parts or chord voicings, or just doubling to try to get it fatter can create more problems than it solves. Don’t duplicate mud, and indistinct variations. At the very least, change the sound of one part dramatically, use a different guitar (one with single coil pickups and the second with humbuckers, maybe) different amp, effect or mic set up, or sculpt the tone. (See ‘thickening’ later, for doubling in the mix). • Room Mic: Your room mic can greatly increasing the ‘fatness’ of your guitar track. You can tweak the apparent size of the room (from studio iso booth to arena) with some judicious delay in front of the room track. Ten miliseconds of delay creates the impression of roughly 10 feet of added distance. It’s fake, because it messes with the reflections ratio of what would be natural in a bigger room, but it can work. In the mix, the room mic can really help create some space, and set right in the mix, can add a different element of ‘fatness.’ Experiment with a touch of a really short room reverb preceded by EQ rolling off low end and higher frequencies, unless you recorded in a large bright room, in which case the natural room reverb may be all you need, particularly when well processed. Pumping compression can be a great effect too – medium attack and short release. Mixed just behind your main guitar bus can add a great dimension. Speaking of the room mic, one trick is to use the vocal track to ‘duck’ the room track – just set up a good compressor with a side chain driven from the vocal track(s) and adjust your compressor to clamp down on the room track during the vocals. This is great to get some movement and dynamics into your track, and help create a space for your vocals which are roughly in the same part of the spectrum as the guitars. Just don’t set the attack and release too fast or it’ll sound fake. • Stop listening to solo’d tracks. To isolate a noise, a bum note, or adjust broad effect parameters (to get the routing set and make sure the settings are approximately right), go ahead, but don’t waste your time fine-tuning guitar sounds in solo – they almost certainly won’t work when in the mix. You need to make these changes when listening to your track in context with the other instruments and vocals. You’ll be surprised how often a great sounding guitar track ‘in the mix’ sounds quite awful solo’d. • Thickening: Create one or two extra tracks. Make copies of the guitar tracks or regions. Insert a pitch shifter plug-in on each copy, and adjust the cents slider slightly. Also EQ one track so that it is different from the original – you can get brutal with HP and LP filters. • SubMix channels: Useful for controlling. processing and maybe automating your guitars. 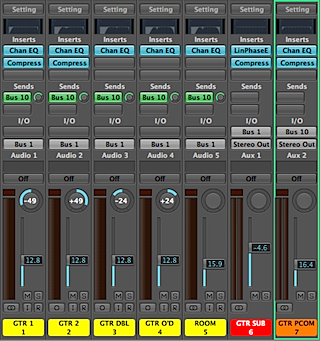 Instead of outputting your tracks to the mix bus, route them to a new bus and bring that bus up on new track(s). Now you can add additional processing (see the compression section below) or add the final touches to get them sounding right. Pan to taste – although I often prefer to not use extreme L-R, but instead narrow the stage slightly – your material will determine the best choice. Experiment with adding a really fast delay to one side, returning to the other, with different EQ. • Dual Stage (Serial) Compression: Often, two compressors are better than one. You need two compressors (or plug-ins) of different types. The first is set to just control the peaks. 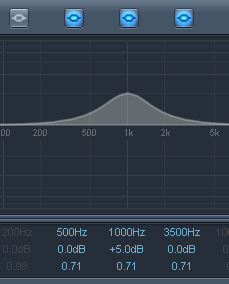 Use a fast compressor (an FET compressor is good) with the threshold set so only peaks are being affected. Use a fast attack and a fairly aggressive ratio, depending on your tracks. Follow this with another compressor (perhaps a Opto or VCA type) where the threshold is set much lower, with a lower ratio and slower attack than the first compressor, which will affect the body of the sound and help add sustain. Depending on your track, reversing this order of compressors can work better. See here for more details on compressor types. Finally, if you’re sending your guitar tracks (perhaps the rhythm guitars) to a guitar sub mix, you can apply more yet more compression on the bus, maybe with a muti-band compressor which can make it play better with other elements of your mix, especially vocals. This technique often works well on other instruments too, drums and vocals in particular. Set right, two compressors together adding quite heavy compression can sound much more natural than one. A technique often used for drums and vocals, this works really well for guitar tracks too. The idea is to have some/all of your guitar tracks routed to a sub mix. Then send the individual guitar tracks to another bus. This bus gets EQ’d and heavily compressed. Bringing the return of the parallel compression bus up so it’s just below the level of the main guitar sub mix; this can add a great thick, fat sound without affecting the main attack and definition of your original guitars left unaltered on the GTR SUB (see below). Here’s a simple routing which may help you set this up. In the example, Logic is used, but you can adapt it to your system easily. There are several options which may apply to your particular tracks – whether you send pre/post fade is a consideration, and depends on whether your guitar parts are mostly static, or if you’re likely to be riding these levels in a mix. Remember that if set to post fade sends, changing the send levels will affect the effect, as the compression change depending on the levels seen at the compressor’s inputs and the threshold set. That’s it for now. Please add additional tricks and tips in the comments section. If this brief article encourages you to try to create your own sounds, then great. Above all, have fun, and help keep alive the concept of developing great rock guitar sounds and textures.